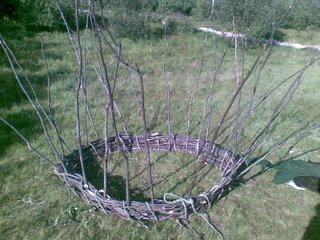 The currach I made at Lofotr got some press attention. It was published in the local paper Lofotposten. Here is the scanned article. I’m sorry for the curled paper causing the bad scanning. Start by scoring and breaking off a palm of antler. The antler in question here is reindeer/caribou antler. As usual, use hot water when working antler. Score or scrape along the edges so you can split the piece with a wedge. My split wasn’t totally successful, but I actually think the result got better because it ran off. It gave a stronger handle. The teeth should be rombic in cross section and of course have a little spacing in between. 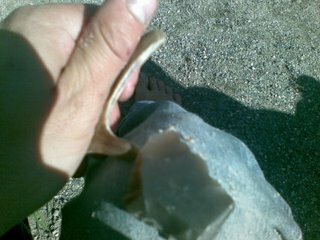 This you can achieve by scoring, splitting and abrading with a rough piece of quartzite between the teeth. 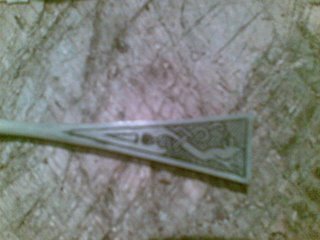 The handle was engraved with a stone flake. Take several turns, score first superficially, then deepen the grooves. The grooves can be highlighted with a mixture of charcoal and wax (best in my opinion) or charcoal and fat. 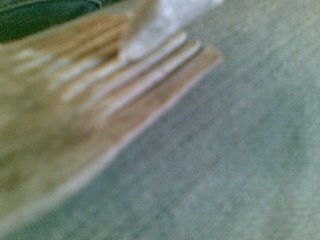 3 needles of whale bone. 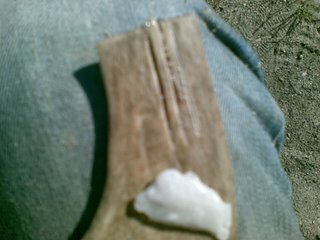 1 needle of elk (moose) antler. 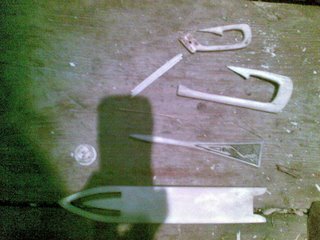 1 large fishing hook of cow bone. 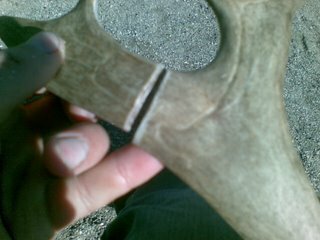 1 medium sized fishing hook of elk (moose) antler. 1 engraved cloak pin of cow bone. 1 netting needle of cow bone. 1 engraved button of whale tooth. 2 hide scrapers of reindeer (caribou). 1 small engraving knife of iron. Hafting for a bowdrill bit of iron. 4 metres of a 50 metres long salmon net of linen. 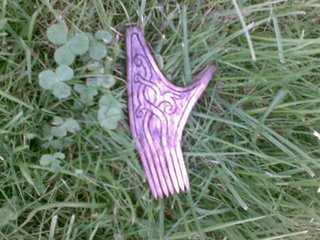 A composite antler comb (reindeer/caribou antler). Not much may some say, but keep in mind that this museum has on average around 500-700 visitors per day, making questions from the public a major occupation. Some of the projects on the photo below. A closeup of the cloak pin. Poor quality because of the bad light in the house. The museum owns three viking boats. This is the larges one. Note the new horse head in the front, carved by Doreen Wehrhold. Hopefully I’ll have the opportunity to go back next year to finish the unfinished projects + do a number of new ones. 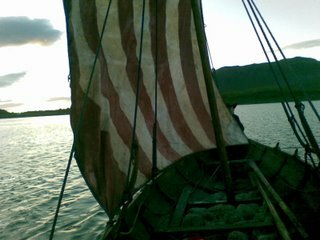 Yesterday I was out on my second sailing with the small viking boat called “femkjeipingen” because of it has room for 5 rowers. This is a very quick boat, even for one person to row, so I imagine it would be excellent with five. Sailing is however of course more desirable. The wind this time was almost absent and changed direction all the time, but at the end of the trip we had very good wind. With it’s large single sail this boat is very quick, but two people is really too little as you need more people to redistribute the weight in the boat as needed. I sat on the rodder, while Flurin, a travelling blacksmith from Switzerland sat in the front. Note that this photo was taken when the wind conditions were less than optimal. This is a boat I WANT! But I guess I have to make myself a large currach to sail instead. 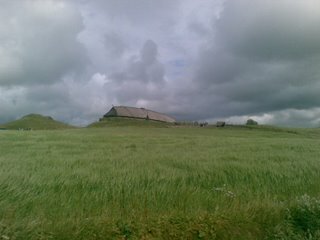 Here is a photo of the chieftain’s hall taken from distance. 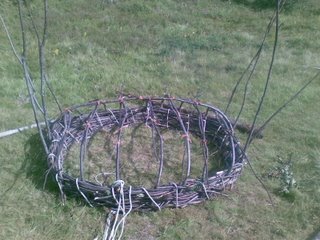 I have learnt quite a bit from my the last currach/coracle/bullboat I made. On that one I did a lot of mistakes, most of which I managed to avoid this time. This site also gave me a lot of needed new inspiration. First of all, what you need to get is a cow hide (or some other large animal). Making the frame takes about 1 day, but dehairing the hide in a stream takes substantially longer. 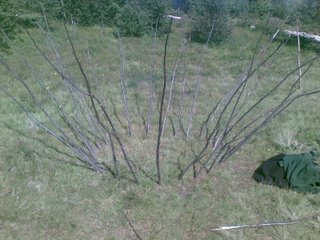 The frame is started by sticking a circle or semicircle of an equal number of rowan rods into the ground. They don’t need to sit deep, but they should preferably be stuck to an angle outwards. Next you start a special type of weaving where you bring in one and one rod so you get a type of diagonally overlapping weave. The currach site explains it better. The secondary weaving is done in the ordinary fasion with one round at the time before starting an opposite one. Bend the withies down and pull 2 and 2 over eachother. This will give the boat a slightly more rectangular or square appearance in the end. Tie the crosspoints with strong cordage or leather. There was in my case no need for it to be weighed down for the recommended 10 days. Take the dehaired hide and stretch it gently on. 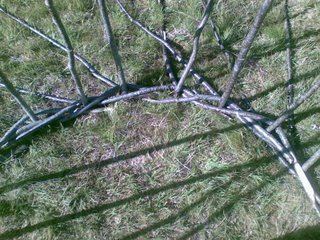 Use the longer parts, the legs and such for rope and tie it to the frame. 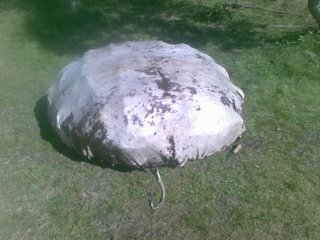 I didn’t bother to cut the protruding points and they made it easier to tie the hide to the frame. The currach ended up quite big and very stable. 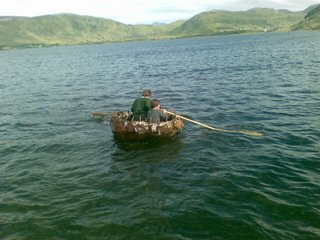 Here is a photo of two of the viking voluntaries, Brage (14) and Gaute (12), rowing the currach with oars.